Lisa Russ Spaar is the author of Satin Cash; Poems, Blue Venus: Poems, and Glass Town: Poems, for which she recieved a Rona Jaffe Award for Emerging Women Writers in 2000. She is editor of Acquainted With the Night: Insomnia Poems (Columbua UP, 1999) and All That Might Heart: London Poems (University of Virginia Press, 2008). A collection of her essays about contemporary poetry was published by Drunken Boat Editions in 2013. 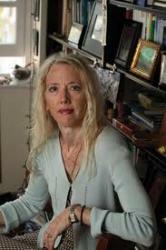 She was awarded a Guggenheim Fellowship for 2009/2010 and serves as poetry editor for the Chronicle of Higher Education. to excrement, as when God invades the ear. signal beneath the pond’s glass. sheep’s-gut johnnies tied to the flagging horn with red ribbons. I hardly understand one word I write. clumsy tutor’s hands once fumbled in her tiny doll house. still gloaming behind his feminine, his bent & supple spines.